A profligate impulse buy for some women is a pair of Jimmy Choos. Me, I walk into a farmer’s market to pick up a few veggies and come home with a pomegranate tree. Small children and dogs know that late June is the absolute worst time to plant anything in LA, what with four months of intense heat and drought on the horizon, guaranteed, which is to say that I should know better. So why did I do it, you might ask. (My husband does not ask this question; he just shakes his head and asks where to dig the hole.) It’s not the fruit: too much work for so little pay-off. The shape of the tree is nothing special either. It will be just sticks in winter. Truth be told, it’s the flowers. The California poppies were done and I was jonesing for a splash of orange. While traditional English gardeners and convicts eschew the color orange, for me, it is the color of pure joy. It enlivens any landscape. Even New Englanders let down their guard when fall rolls around and the perennials are put to bed. Then, pumpkins grace every doorstep and maples, sassafras and ash trees go down in a blaze of glory. My first orange crush was an Asiatic lily that burst on the scene of the late spring garden in Massachusetts. It set off the purple aconitum and a deep magenta peony to such effect, I was forever smitten with the color combination and repeat it wherever I can. That’s the nice thing about orange, once you leave the pastels behind, it looks stunning next to almost any other color. It’s no wonder that when I saw Bonnie Lambert’s painting “Proud Cloud“, I had to buy it. It pleases me to no end that I moved to California, where the state flower is orange and there is no shortage of orange flowering plants. When the poppies finish up, lion’s tail blooms in the shadier parts of my LA garden. In full sun to partial shade, lantana is the workhorse of the garden, pumping out orange blossoms for months on end to delight of butterflies and hummingbirds as well as me. In the fall, orange cosmos will spring up from last year’s seeds. 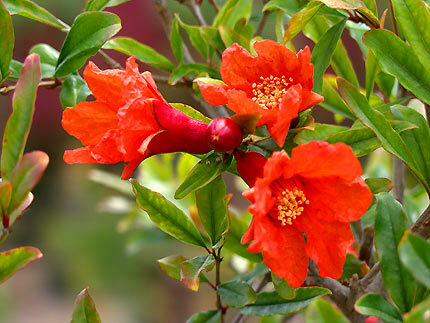 And next June, after much watering, a lot of luck, and a blessing from the great garden gnome in the sky, a fountain of orange flowers will cascade down the branches of my pomegranate tree. “…he just shakes his head and asks where to dig the hole.” Yep, that’s Mark! Good luck with your new purchase. As you know, Mom loves orange marigolds (and yellow). You mentioned your California poppies – my poppies haven’t even gotten to the point of budding yet this summer. They are, by far, my favorite flower! You’re so blessed to live in a place where the weather allows so many different plants to bloom most of the year. Enjoy!! !